Tony Foreman and Cindy Wolf have managed to put Baltimore on the map of fine dinning since the late 90’s with the following restaurants: Charleston – American new cuisine -, Cinghiale -Northern Italy and enoteca – ,Pazo -Italian/Spanish/Mediterranean- , Bin 604 -Wine Cellar, Johnny’s -Cafe/Wine/Bar, and Petit Louis Bistro -French food-. Although I love French food, I had never visited the French Bistro in Baltimore. Last Friday coming out of Sushi Sono – my favorite Japanese place in Columbia -, I noticed a busy restaurant next to it. For many years this place was being rented by Chinese food businesses and although this area by the lake Kittamaqundi is very popular, the restaurant was always empty. This time I noticed full tables through the glass windows, and raising my eyes I realized why. 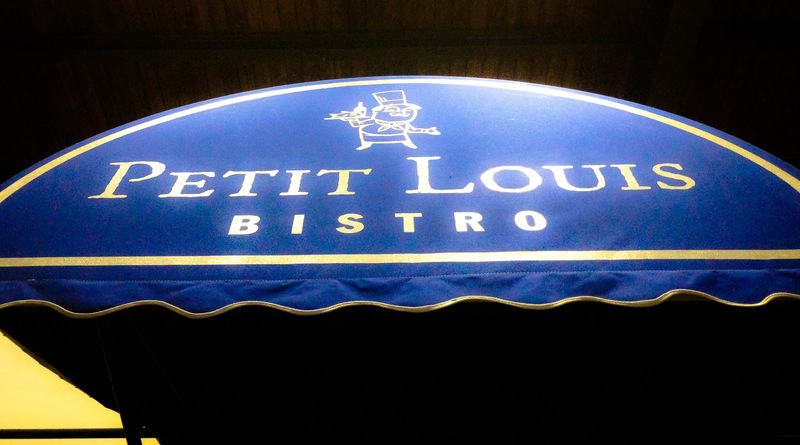 The Petit Louis Bistro, including a restaurant and a pastry/coffee shop, has come close to us -a fifteen minute ride – giving us more choices for good dinning in the area. I made reservations right away. The interior is spacey and classic. The hostess greeds you with a bienvenu, then she turns the conversation to american english, and at the end she wishes you bon appetit. However most of the servers speak really French and that is a nice touch, rarely found in the French restaurants in the United States. The service is very good, reasonable wait between courses, polite servers and not much interruption during eating. As a matter of fact I noticed that the server would not approach unless you are not chewing or drinking. The menu is representative of a French bistro but of course there is no way I could sample everything. The terrine a la mode was wonderful and sinful, almost silky . Unless there are no cholesterol concerns, I would share it with more people. The aubergine crocante with goat cheese and pistou was also a good choice as an appetizer. A great stake, flame broiled to perfection but.. here comes the but.. the fries were a bit to the greasy side. The croque monsieur was also greasy for my taste. One expects French food to be buttery, fatty and rich, however this to me was overwhelming. I am looking forward to try some lighter specialties next time. The cheese trolley was interesting with good selections and the wine list good too. My gateaux aux cerises was great. I will definitely go again to try the escargot and the trout almondine. The location, the ambiance and many of the dishes make this a nice place to dine in Columbia.